SchoolBrains drastically reduces the work required to complete your state reporting requirements. Unlike other systems, SchoolBrains remembers you work from last year and allows you to update changes. SchoolBrains has them all and the integration with student, school and teacher data to dramatically reduce your administrative workload. Throughout the entire solution, SchoolBrains incorporates functionality, forms, analysis and reporting to assist school districts in complying with mandatory regulatory requirements and reporting. 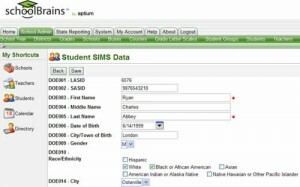 SchoolBrains facilitates compliance with both federal and state requirements. SchoolBrains automates many tasks relating to compliance with state and federal regulatory requirements. And, as the regulations change, SchoolBrains will make sure that you’re up to date. SchoolBrains is a Top 100 Product. Contact us today and we’ll tell you why.